Yes, this may be blunt, but it seems to be the best way to drive the point home. 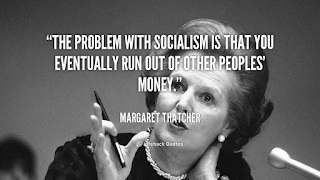 History has shown us time and time again that socialism has been a complete and utter failure everywhere it has been tried. Venezuela is just the latest example of how a country once rich in oil and natural resources squandered it by pursuing the socialist ideology. The list is long of countless countries who embarked on this philosophy of failure. The list includes the Soviet Union, Cuba, North Korea, China, Cambodia, Poland, East Germany, Ethiopia, and Romania. Socialism ultimately fails because it kills and destroys the human spirit. Just ask the people of Cuba and Venezuela. It is an equal sharing of miseries and the poor get poorer. Socialism is for the people and not for the socialists. In a socialist society all people are equal but some are more equal than others. The socialist elites live in luxury as the people scrap and claw to find food. It is an ideology that ignores incentives. It is based on the theory that incentives don't matter and that is incredibly inconsistent with human nature. As Milton Friedman put it, "The enduring lesson of the 20th century is that socialism is a failure, and free markets are a success. But the politicians keep advocating just a little more socialism." 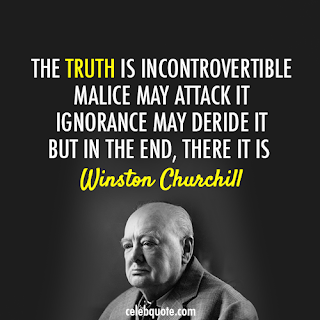 Churchill learned this simple truth first hand. He watched and warned Europe throughout the 1930's that Hitler must be confronted and dealt with. 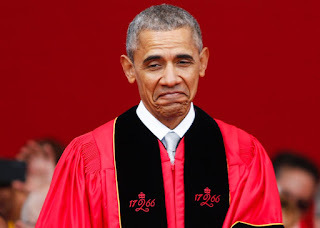 The leaders of Europe laughed at him and chastised him as they continued to appease Hitler. Germany had been crippled considerably after the Treaty of Versailles in 1919. When the Weimar Republic collapsed and Hitler took the reigns of Chancellor in 1933 he embarked upon making Germany a strong country again. Great Britain and France allowed Hitler to grow stronger through appeasement. They allowed him to rebuild his navy, remilitarize the Rhineland, merge with Austria in the Anschluss, and gave him the Sudetenland which in effect gave him Czechoslovakia. Prime Minister Neville Chamberlain of Great Britain waved a piece of paper signed by Adolf Hitler proclaiming, "Peace for our time." A year later Hitler rolled his tanks into Poland and thus began World War II. 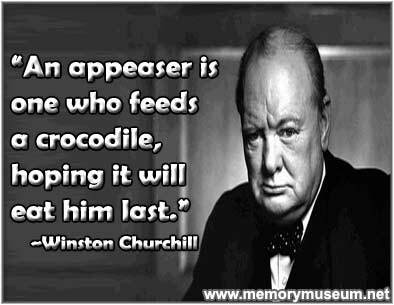 Appeasement never works and just kicks the can further down the road to far more dire consequences. If Hitler had been dealt with earlier a world war might have been avoided. In recent years Iran, China, and North Korea are prime examples of various levels of appeasement. This simple truth of history continues to be largely ignored with the potential yet again for more dire consequences. Churchill, in his book The River War, writes a first hand account of the British imperial involvement in the Sudan, and the Mahdi War between the British forces and the Dervish forces. He witnesses the conflict between Islam and modernity. 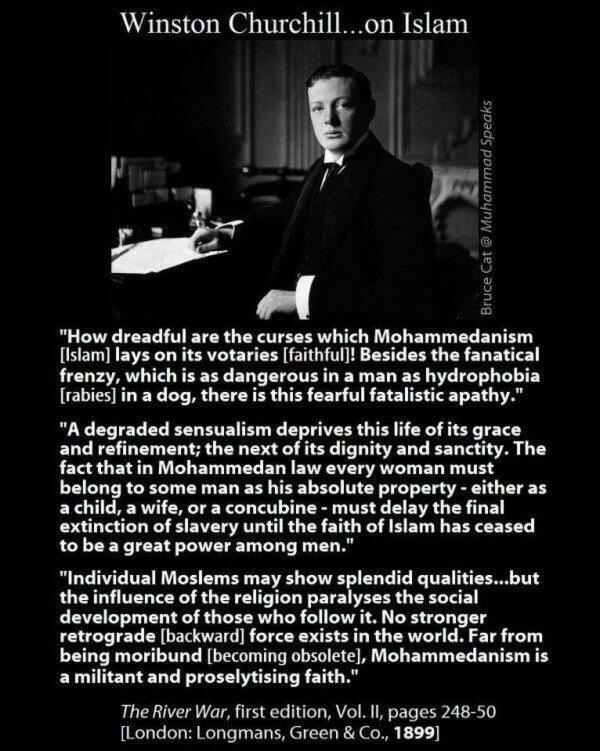 In his book he uses the term Mohammedanism instead of Islam. This is a simple truth that largely gets overlooked by many. Mohammedans are followers of Mohammed, who is the perfect Muslim. It is a much more accurate description. 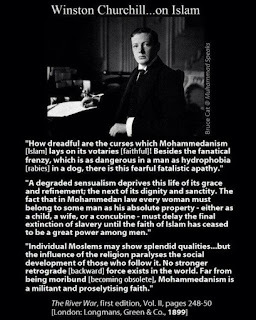 Churchill describes the fanatical frenzy of Mohammedans and lays out the historical truth that many today choose to ignore. That truth is a 1400 year history of a militant and proselytizing faith. He rightly states, "Individual Moslems may show splendid qualities...but the influence of the religion paralyzes the social development of those who follow it. No stronger retrograde force exists in the world." Mohammedanism is a political ideology. Mohammed's success depended on violence to persuade kafirs, unbelievers, that he was the prophet of Allah. He committed 100 separate acts of violent jihad in his last nine years of life. Mohammed, the perfect Moslem, attacked every neighbor he had. Whether Christian, Jew, or Pagan it didn't matter. If you understand and learn the historical truth of Mohammed, his life and his bloodthirsty history, you will know Mohammedanism, Islam. So why are these three simple truths of history so important to understand and comprehend? This is where, as Churchill put it, we need to use a pile driver. All three of these historical truths are currently affecting our world today. 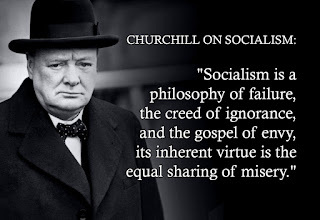 Socialism is gaining popularity among many of the young people in our republic and this historical truth that it is a complete and utter failure needs to be pounded home day and night. 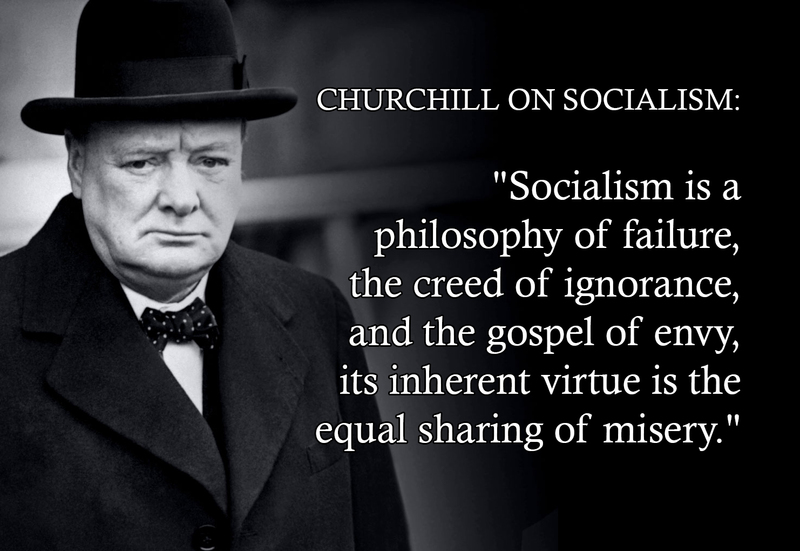 Socialism is an equal sharing of miseries. It belongs in history's unmarked grave of failed ideologies and lies. 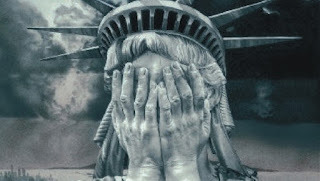 Likewise, not only America, but the rest of the world needs to understand that appeasement never works. When we appease countries like China, North Korea, and Iran we put the entire world in more danger. It emboldens these countries leaders to continue in their nefarious activities and leads us on a much darker path to dire consequences. And finally, the simple historical truth of Mohammed and his followers bears understanding and being fully awakened to. If you know Mohammed you will know Islam. You either submit or be killed as their jihad rages on. 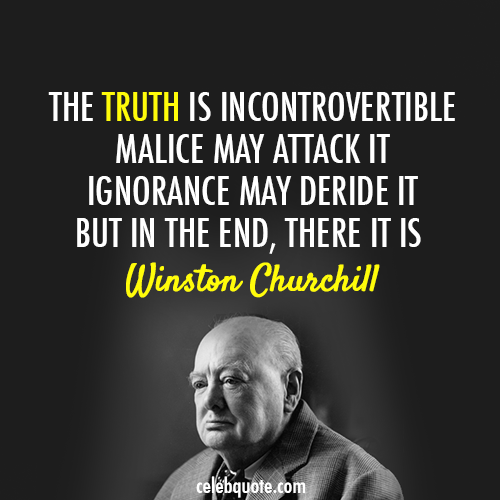 The sooner we as a republic and a world understand these simple historical truths that Churchill laid out the sooner we can avoid more violence and heartache that previous generations failed to avoid.